Greetings from a very warm, but overcast Sandbridge beach on this last Monday in February. We are so excited that Spring is just a few weeks away and the warm temperatures we have seen lately just whets our appetite for consistently warm weather. We can’t wait to be able to take walks on the beach with our friends and pets and so this week’s Memory Monday we are entitling Doggin it. Don’t you just love this photo? It comes to us from Mary Cherry who stayed with us at Sandbridge Blue last September and actually provided us not only a photo, but a video of her subject. Take a look at the star of this week’s Memory Monday in action. Well, maybe not so much action, but no less a video of our star…. 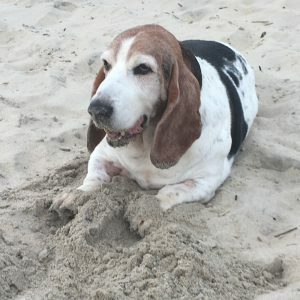 Then we have a standard beach photo of Mary’s Bassett Hound “doggin’ it” at the beach. Looks a little tuckered out from the walk to the beach from the house. We have reminded you before, but we will do it here again to let you know that we have quite a number of houses that accept your dog friends on vacation at no extra charge. When you consider the cost of boarding your pet while you are away and the fact you will miss your four legged friend the entire time you are on vacation it makes a lot of sense to bring fido along with you. 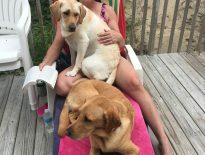 We still have some summer availability on select pet friendly properties so don’t delay and contact us today to get your own place at the beach this summer. 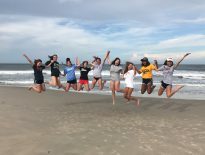 Sandbridge Blue would love to help you and your dog family members have a memorable beach vacation with us. Next Next post: Memory Monday 3/5/18 – Everybody Jump!